Have you all heard of A Snicker of Magic? If you haven't, this is a book that needs to be on your radar. It was written by debut author Natalie Lloyd and it is positively delicious. Natalie graciously agreed to an interview here on A Foodie Bibliophile in Wanderlust, and if her own words aren't enough to convince you to read the book, head on over to Nerdy Book Club today to read my review. 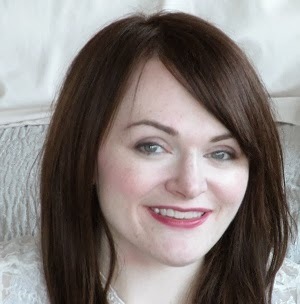 Foodie Bibliophile: Thank you so much for stopping by the blog today Natalie! In my review of A Snicker of Magic, I call you the sommelier of words because you just know how to pair the right ones to make them positively delicious. Where does your decadent love of words come from? Natalie Lloyd: Thank you for such a kind compliment! I think my obsession with words blooms out of several places. For starters, I don’t remember ever not being obsessed with stories. Books have always made my heart spin, and as a young reader, they helped me find my voice and learn how to express myself. But I also feel so blessed to have grown up in the mountain south, which is a storytelling culture. As a kid, I loved hearing my family tell stories as much as I liked reading them. I don’t see words the way Felicity does, but I’m inspired by how words connect people. I’ve given lots of thought to how powerful words can be. Like most everybody I know, my middle school experience was bumpy. I can still remember the exact words someone said to me that broke my heart. But on the flip side, I remember my third grade teacher, Mr. Watson, telling me I would write a novel someday. And I remember so many of the kind, wonderful things my parents and friends said to me. I believe the good words you hear (and choose to say) have a way of sticking to a person’s heart. Affirmation can be such a lifeline for someone else. And I think it’s incredible how words have such staying power. How “I love you” - even though it’s been said billions of times - can be the sweetest, most original words you’ve ever heard. How “I forgive you” can feel so healing. Words are magical, powerful things. FB: Midnight Gulch, Dr. Zook’s Dreamery Creamery, Ponder’s Pie Shop. Are there real-life places that inspired you to create these magical settings? NL: Yes! The boundaries of Midnight Gulch only exist in my imagination (and I hope a reader imagines the town any way they want). But there are definitely places I love, and pulled from, to give the Gulch some life. One of my favorite drives in Tennessee is Highway 11; the part that stretches between Knoxville and Chattanooga. If you drive that road, you’ll pass through adorable downtown Loudon. To get to Loudon, you cross a bridge over the Tennessee River. The first thing you see once you get off the bridge is a mural painted on the side of a building. (This layout will sound familiar to those who’ve visited Midnight Gulch. ;). 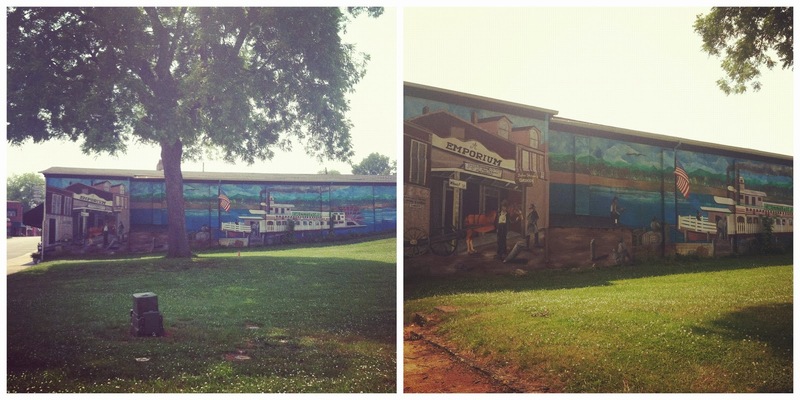 If you park your car near the mural, it’s a short walk to a funky little ice cream shop called Tic-Tok. Athens, Tennessee is only a short drive from Loudon. It’s another wonderful little town, and boasts a well-known ice cream factory. In my mind, Midnight Gulch also looks quite a bit like Franklin, Tennessee (a gorgeous town near Nashville), where song lyrics and guitar-strums are tangled up in nearly every breeze that blows your hair back. So, yes, I definitely tried to pack several places I love into a fictional place. But, for me, Midnight Gulch has always been more of a heart-place. I realize now that I wrote the book because I was homesick for people I love and miss (my grandparents, in particular). While I was writing, I was remembering how they made me feel: unconditionally loved and brave and capable of magic. It’s like that Edward Sharp song lyric, “Home is whenever I’m with you.” I believe that’s so true. I feel most at home when I’m with people I love. FB: Have you experienced a snicker of magic in your own life? I’ve been reading L.M. Montgomery’s Emily of New Moon (my editor sent me the book, because I’m an Anne Shirley fangirl, and yet somehow I missed Emily!). Whenever Emily experiences other-wordly, “magical” moments, she calls them “the flash.” I’m smitten with that description. I feel lots of flash-magical moments in my life. Falling in love is magic. Writing, when it’s good, feels that way. (And it’s not that way every day, but there are times when I write, and time falls away, and I know there’s nothing else I’d rather be doing.) I experience lots of magical moments when I’m around my niece and nephew. Nature is full of flash-magic, too. When I saw Mt. Rainier for the first time a few years ago, I was trembling with excitement. There are so many examples: When I look at stars and feel small in a good way. When my dog nuzzles my tears away. When I hear a song with my heart before I hear it with my ears. Surprising, personal moments of faith that feel so personal, so quietly sacred. Seeing this story published has felt that way; I would certainly describe “magic” as a dream come true moment. But for me, the term also applies to more common flash-snap-blink moments that open my eyes to how beautiful the world is. Ultimately, I think being loved, and loving someone else, is the best magic anybody can experience in a lifetime. FB: I am fascinated by authors whose stories are inspired by musicians they admire. Lenore Appelhans was inspired by Tori Amos when she wrote Level 2 (now called The Memory of After), and in the acknowledgements of A Snicker of Magic you thank your favorite band, The Avett Brothers, who "kickstarted this whole adventure for me.” What about their music took you to Midnight Gulch and introduced you to Felicity Juniper Pickle? NL: Sigh, my Avetts. I’m a big fan of the Avett Brothers, and a few years ago I finally got to see them live. I knew they put on a rowdy, wonderful show, but my heart was not prepared for how enchanting the whole experience would be. As soon as the lights dimmed, chillbumps rippled up my arms. People were dancing in the aisles and screaming along to every lovely lyric. The air was charged with joy. I remember thinking how incredible it was that so many people could come together that way - people who believed different things, who had different backgrounds - and yet music became this magical, invisible thread that bound all of us together for a bit. I elbowed my brother and yelled, “This is more like a magic show than a concert!” I think that concert, and their music, helped me find my way to Midnight Gulch, even though I didn’t start writing the story until several months later. I don’t know if this makes sense, but someday I would love to be able to write the way the Avett Brothers make music. It’s obvious that they’ve worked hard at their craft, but there’s also so much heart in what they do. Their music is never too refined; it’s a roughed-up kind of pretty. So genuine and full of wonder. FB: And last but most importantly, since ice cream plays such an important role in the story, what’s your favorite flavor of ice cream, either real or imagined? NL: Alas, one of the saddest things about finishing A Snicker of Magic is that I can no longer justify eating ice cream as “research”. (…Or can I?) For now, my favorite real flavor is Blue Bell’s Pistachio Almond. But I’m always open to new suggestions! My favorite imaginary ice cream is Dr. Zook’s Blackberry Sunrise. If I ate Blackberry Sunrise right now, it would give me a sweet memory. I would remember eating wild blackberries with my granny on a summer afternoon – late-day sun spilling over the walls and our inky, purple fingertips and how happy I was to be sitting there beside her. That’s the memory that inspired Blackberry Sunrise to start with. I think Granny’d be happy to know I hid that memory in the pages of the book. Thanks again for stopping by today Natalie! I see only wonderful things for you this year as A Snicker of Magic makes its way into the world and into the hands of kids. This book, just like a favorite song, is felt first with the heart. Read my Nerdy Book Club review of A Snicker of Magic. Pre-order your copy of A Snicker of Magic today! Trust me, this isn't a book you're going to want to "eventually get around to." It's a "you must read this NOW!" kind of book. Ok. Adding this to my list. I loved the interview -- great job. If I didn't have a gazillion inches of snow surrounding my house I'd have ice cream too. One of our local dairies makes the best ice cream. I'm always torn between mocha chip, coffee, lemon custard, and coconut chip. Well, that interview completely sold me on reading this book. I love middle grade, food and magic, so it sounds lovely... and a 'word collector!' Could it be any more perfect?! Such a terrific interview and I am going to look for Blue bell Pistachio Almond ice cream- yum. 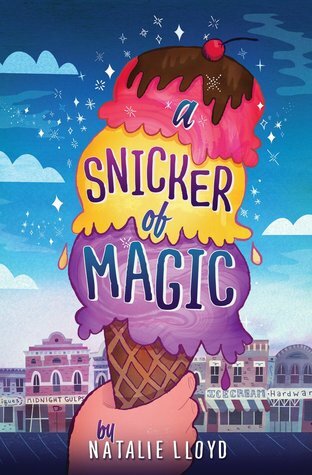 Happy book birthday to A Snicker of Magic!